Capture a single wish, accomplishment, or meditation every week throughout the year inside this work of art. Your birthday is like a private New Year's celebration-- a chance to reflect and look forward to the milestones you plan on reaching in the year to come. With this sentiment in mind, Jill Henrietta Davis created her birthstone wishing ball to capture a single wish, accomplishment, or meditation every week for the coming year. 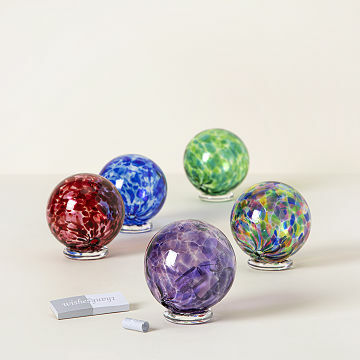 Each shimmering ball of hand-blown glass comes with 52 tiny slips of paper for you to pause once a week throughout the year and record a message of hope or gratitude. Coil them up and tuck them in the tiny hole near the base and they become a permanent part of the display. People often ask Jill why the wishes can't come back out, and she explains in terms of birthday candles: "When you blow out your candles, you don't tell the wish you made, otherwise it won't come true. But more importantly, memories are always more beautiful than photographs, and the same is true of wishes. When you look at the little slips of paper accumulating in your Wishing Ball, I want you to think about the big picture those messages convey. Rereading the notes would be like looking backwards, or trying to step in the same river twice." Available in twelve vibrant hues that correspond to each month's birthstone. Handmade in Pawtucket, Rhode Island. 4" H x 3.5" diam. Includes 52 slips of paper. It was a gift. My friend loved it. Her favorite color is blue, so the colors in the April wishing ball are perfect. I think she will love filling out the slips of paper when you need a little extra help with wishes. i would definately buy this again! This gift is great...it is both beautiful and forces the recipient to take 5 minutes a week for themselves. I loved it. I got it. This is given to people 8n memory of someone. .